Physicists at the Technical University of Munich (TUM) have developed a nanolaser, a thousand times thinner than a human hair. 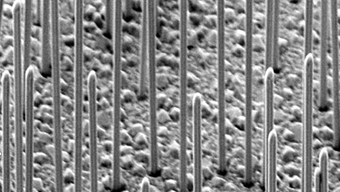 Thanks to an ingenious process, the nanowire lasers grow right on a silicon chip, making it possible to produce high-performance photonic components cost-effectively. This will pave the way for fast and efficient data processing with light in the future. Ever smaller, ever faster, ever cheaper – since the start of the computer age the performance of processors has doubled on average every 18 months. 50 years ago already, Intel co-founder Gordon E. Moore prognosticated this astonishing growth in performance. And Moore’s law seems to hold true to this day. Data transmission and processing with light has the potential of breaking the barriers of current electronics. In fact, the first silicon-based photonics chips already exist. However, the sources of light for the transmission of data must be attached to the silicon in complicated and elaborate manufacturing processes. Researchers around the world are thus searching for alternative approaches. 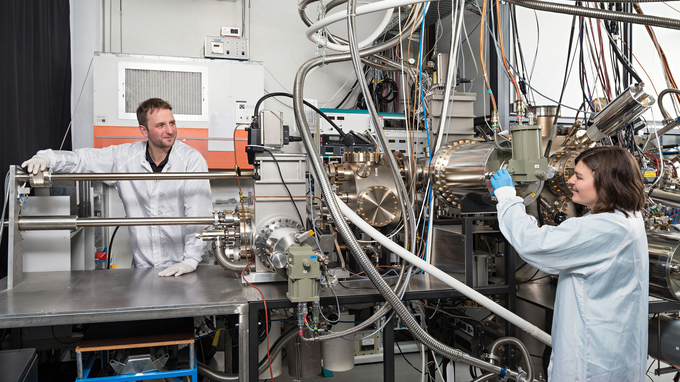 Scientists at the TU Munich have now succeeded in this endeavor: Dr. Gregor Koblmüller at the Department of Semiconductor Quantum-Nanosystems has, in collaboration with Jonathan Finley, developed a process to deposit nanolasers directly onto silicon chips. A patent for the technology is pending. The TUM team solved this problem in an ingenious way: By depositing nanowires that are freestanding on silicon their footprints are merely a few square nanometers. The scientists could thus preclude the emerging of defects in the GaAs material. But how do you turn a nanowire into a vertical-cavity laser? To generate coherent light, photons must be reflected at the top and bottom ends of the wire, thereby amplifying the light until it reaches the desired threshold for lasing. Only once the wires protrude beyond the mirror surface they may grow laterally – until the semiconductor is thick enough to allow photons to jet back and forth to allow stimulated emission and lasing. 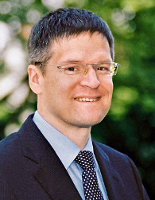 “This process is very elegant because it allows us to position the nanowire lasers directly also onto waveguides in the silicon chip,” says Koblmüller. Currently, the new gallium arsenide nanowire lasers produce infrared light at a predefined wavelength and under pulsed excitation. 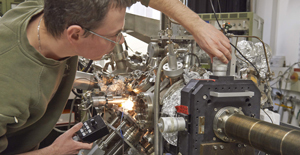 “In the future we want to modify the emission wavelength and other laser parameters to better control temperature stability and light propagation under continuous excitation within the silicon chips,” adds Finley. The team has just published its first successes in this direction. And they have set their sights firmly on their next goal: “We want to create an electric interface so that we can operate the nanowires under electrical injection instead of relying on external lasers,” explains Koblmüller. 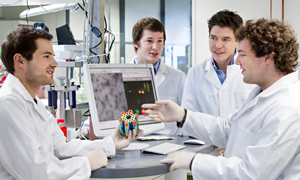 The research was funded by the German Research Foundation (DFG) through the TUM Institute for Advanced Study, the Excellence Cluster Nanosystems Initiative Munich (NIM) and the International Graduate School of Science and Engineering (IGSSE) of the TUM, as well as by IBM through an international postgraduate program.